Flick Quarterback offers much more than its controls and impressive graphics however. 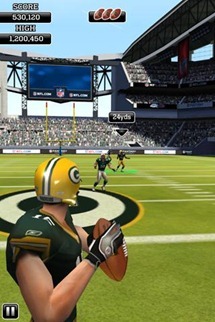 Players can choose from Playmaker and Trick Shot modes, which each offer their own unique gameplay twists. 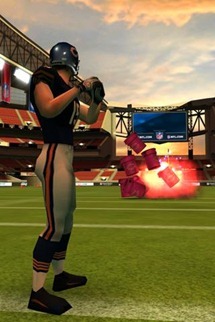 Additionally, the game offers day or night time play, as well as elemental obstacles like wind, meant to make gameplay more challenging by throwing off your passes. 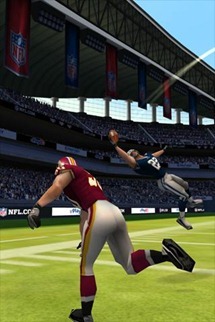 Players are even able to choose their favorite team and customize their jersey name and number. 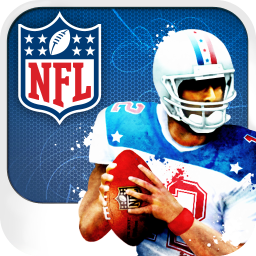 NFL Flick Quarterback is a bit more expensive than the other names in the Flick family, priced at $2.99, but it seems like a great game to pick up and play if you've got a few minutes of downtime, and makes a nice addition to Full Fat's collection.